The Robyn's Nest: 33 Weeks Pregnant! 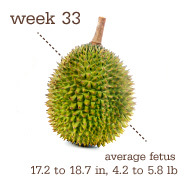 Baby Growth: Baby C is over 4 lbs at this point (ha - we know he is MUCH bigger than that right now thanks to our ultrasound last week) and is over 17 inches long. He is growing like crazy this week and may grow up to an inch in length just this week alone! His bones are starting to harden this week and he is also starting to keep his eyes open during the times that he is awake. What in the heck is this thing?? I have no clue! My Symptoms: I'll be completely honest with you, I am NOT feeling very positive about much that has to do with this pregnancy right now. There have not been many times this pregnancy where, overall, I have felt miserable, but I am totally at that point right now. I think that a LOT of my feeling this was has to do with the fact that I'm finishing up things at school (today was my official last day until the end of October! Woo hoo!). 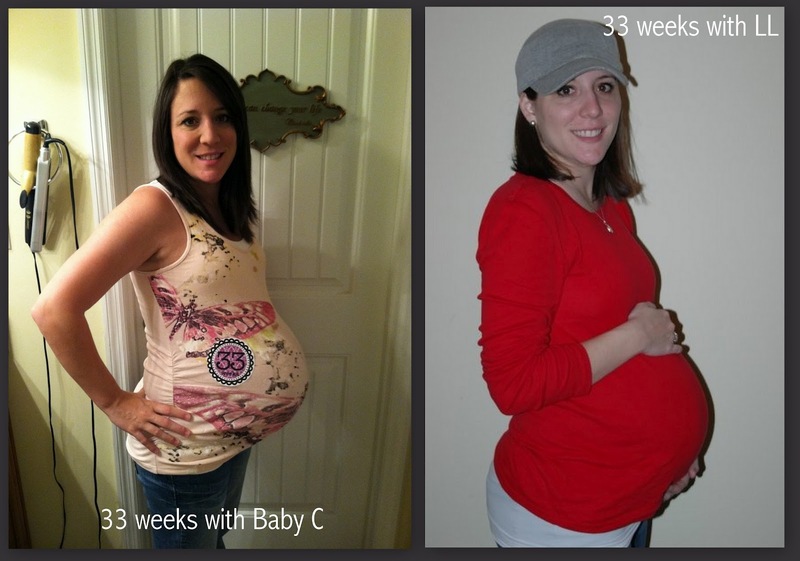 I am beyond happy that I'm not working until 39 weeks like I did with LL. So even in my negativity, I feel so blessed that I am home with my sweet girl from here on out! In an attempt to keep myself as positive as possible, here are some positive symptoms this week: my face has been looking pretty good lately - I've not had any bad break outs in a while. The rest of me still looks pretty small and Matt says I still don't look pregnant from behind. My chances of coming out of this smaller than where I started are pretty good, I think. My chest looks pretty awesome - haha. I'm still able to eat a pretty decent sized meal. I remember with LL I would get SO frustrated because I couldn't eat a full meal for a LONG time before I had her. Weight: I gained 2 lbs this week. Bleh. I don't even get how. Oh well. This puts me at 20lbs so far. I guess that's still not bad considering that Baby C is HUGE. Movement: I am so shocked that this little guy is still moving SO MUCH even though he is so big and has so little room in there. I'm telling you - this little guy moves ALL the time. He has discovered my ribs and can tech them when I'm laying down. LL never did that until I was in labor. I also have had a few moments where his kicks/movements have legit hurt. Those don't happen often, but they do every once in a while! Sleep: Ugh. Terrible. I have a hard time getting comfortable. I get so crazy hot. It hurts like its no body's business to roll over. Whatever hip I'm laying on will get a bad pain. It's just an overall mess. What I Miss: Sleeping. Having clothes to wear. Being able to do anything for longer than .8482 seconds without getting completely out of breath. Cravings: Milk. Every night about 8:00 I crave a huge glass of milk. Gah. So good. Best Moment of the Week: this past weekend my sister and my aunt were in town for a BBQ to celebrate my mom's retirement. I had such a good time seeing my family! 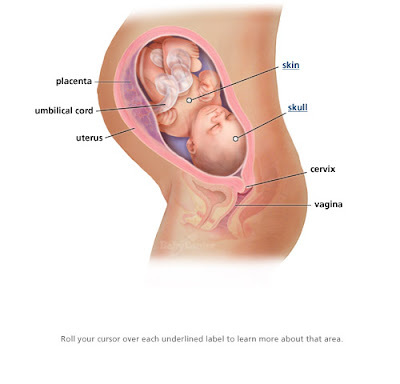 Questions or Concerns: I have Ben having quite a bit of Braxton Hicks the past couple of days. It's something I need to keep an eye on for sure. Stopping by from Kelly's after your comment on my blog. Girl, you look GREAT! 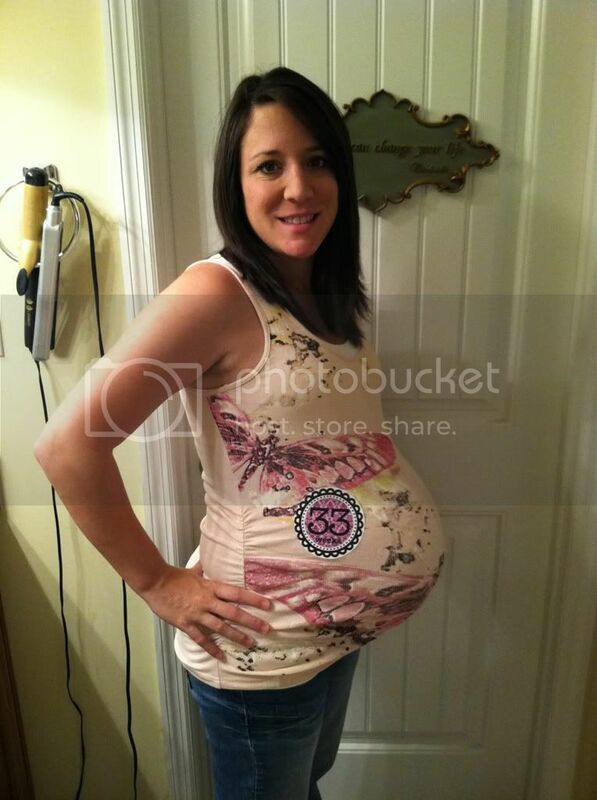 Way to rock the belly! I'm with you on the night sweats and hip pain. The first night I thought I had peed the bed then I realized I was wet all over and sweating...GROSS. Yay for being out for the summer, plus some! That HAS to be a great feeling! Rest up! Congrats on baby boy! You look amazing and sound so great! Where did you find this blog pregnancy thing? John and I just found out we are having a baby as well and I want to journal the pregnancy because the pregnancy will be extremely high stress! I've tried emailing you a few times because I left fb but I can't figure what I am doing wrong.